Find out here what makes Gottlieber cocoa almonds so special, where almond trees come from, how much effort goes into the processing of almonds, why they are good for you, why they make you beautiful, the symbolic meaning of a gift of almonds and the fact that they are also used as a currency. 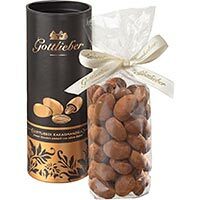 Carefully roasted almonds from Gottlieber Spezialitäten AG are coated with exquisite, melt-in-the-mouth chocolate and sprinkled with the finest cocoa powder. The result is tempting: crunchy and harmonious in flavour - pure pleasure. These classy, crunchy pieces come in an exclusive round 200 g pack, turning a delicious present into a true highlight. In short: when a feast for the eye is combined with a feast for the palate, nothing can go wrong. 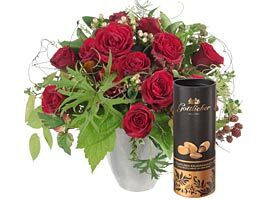 Because flowers are an emotional gift and win hearts, while cocoa almonds are tempting and make the recipient melt in quite a different way. Fleurop flowers & Gottlieber cocoa almonds? You'll find the shop HERE. Admittedly, Gottlieber has made almonds into something quite unique. But in actual fact they have been known since early times. Almond trees have been cultivated in Asia since the early Bronze Age. And their fruits weren't just a snack for caravan leaders on the Silk Road. They were also valuable ingredients in the bread of the Egyptian pharaohs. 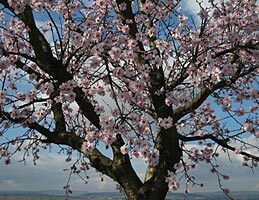 By 900 BC, almond trees were growing in Spain, Morocco, Greece and Israel. 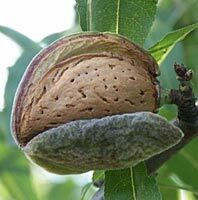 But it wasn't until the 18th century that Franciscan monks brought some trees from Spain to California, where by around 1870 the most famous varieties of almond were developed through research and breeding. In the last 30 years, almond production in California has quadrupled. And in the green valleys around San Joaquin and Sacramento, almonds are actually cultivated on more than one million hectares of land. Around 6,000 almond farmers there produce almost 100 percent of US domestic requirements and more than 75 percent of global demand. Today, Californian almonds are imported by around 80 countries, including Switzerland. 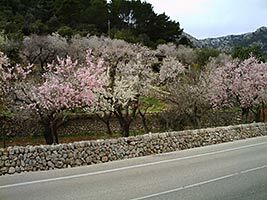 Almond trees blossom in February and March. However, they are not harvested until the end of August to mid October, depending on the variety. That means a lot of work. Because to make it easier to strip the fruit from the tree, the trees are subjected to moderate dry stress a few weeks before the harvest. Then machines drive up and shake the trees. The fruit is left to lie on the ground for about a week to dry it well, then it is collected and freed from dust, twigs and leaves. 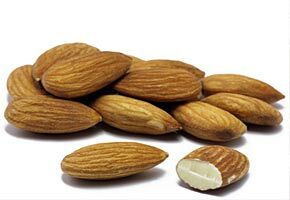 The shells of the almonds are gently cracked open in rolling mills and blown away, then almond processing finally begins. Firstly, they are separated into different sizes using sieves, and eye-checked for damage on conveyor belts. The bad ones are removed at this stage. 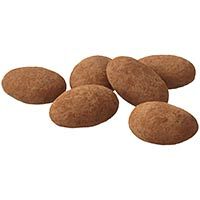 The almonds are shelled by heating them in boiling water so that the soft skin can be easily removed by rubber rollers. And then? Well, almonds that are very, very lucky end up at Gottlieber, are carefully roasted, given a beautiful chocolate jacket and sprinkled with the finest cocoa powder. 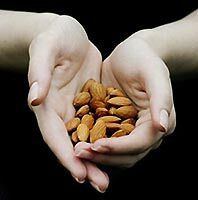 In antiquity, almonds were held to be a symbol of fertility and pregnancy because of their protected kernels. The Romans scattered them at weddings for that reason. 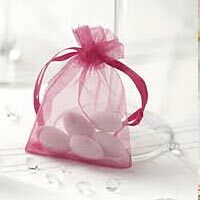 From 1350 onwards, a custom arose in Italy of giving wedding guests five sugar-coated almonds in a little tulle bag. That is still done today. The almonds stand for life, which - like the sugared almonds - are sometimes sweet, but may also be bitter here and there. 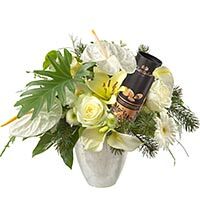 In addition, the five almonds symbolise the guests' wishes for the bride and groom: health, wealth, happiness, fertility and long life. 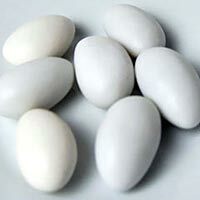 Today, sugar-coated almonds are also given on other occasions. In Italy, they are presented for a birth (with a pink sugar glaze for girls and a pale-blue sugar glaze for boys). In Sweden, on the other hand, an almond is baked into a rice pudding on Christmas Eve as a symbol of luck. It is said that the person who finds it will marry in the coming year. 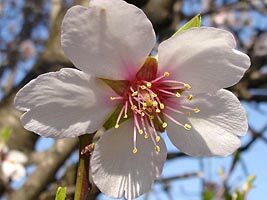 Not least, the almond is also the symbol of patience because of the difficulty involved in removing the edible kernel from its shell. All around the globe, people discovered the health-giving properties of almonds in early times. Their use is documented in ancient medical texts from Greece. And new studies also provide evidence that eating almonds regularly is good for your health. For example, they are thought to reduce the risk of cardiovascular diseases, cut cholesterol, provide protection from diabetes and possibly also improve bone density. In other words: almonds are good for you. And since they're also absolutely delicious, there's nothing stopping you from enjoying almonds more often! Almond oil is very popular for cosmetic use because it is mild and suitable for all skin types. It contains a very high level of linoleic acid and unsaturated fatty acids and is rich in vitamins E and B. 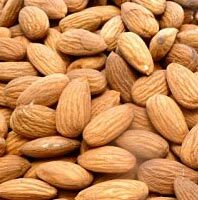 The Ancient Greeks also used it for beauty care once they discovered that oil could be extracted from almonds. 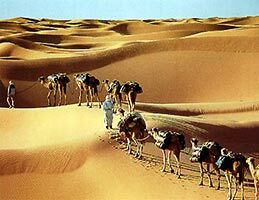 They adopted the recipes for preparing oils, ointments and perfumes from the Egyptians and Persians. 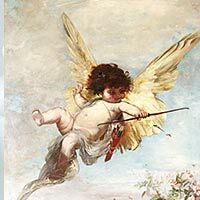 Because personal hygiene and beauty care were very important to them, they invented the word "cosmetic", which comes from the Greek verb "kosméo" meaning roughly "to put in order" or "to decorate". Later on, the Ancient Romans discovered the benefits of cosmetics … but only until the advent of Christianity. After that its use was restricted for many years. Not entirely, though, because the Church had no objection to oils and ointments with medicinal properties. 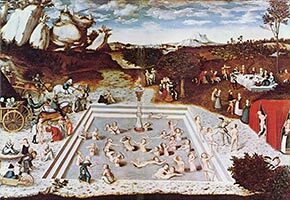 That was a real stroke of luck for almond oil, which was "medically indicated" until personal hygiene and beauty care returned to prominence. Nevertheless, a long time passed before the oil's tremendous value was discovered. Before the Gottlieber almonds can be coated in chocolate and sprinkled with the finest cocoa powder, there has to be cocoa. This fact has long been known. 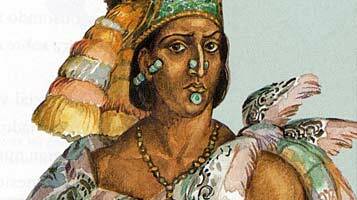 Cocoa is thought to have been used in Central America as far back as around 1000 BC. But not just as a nectar reserved for the rich and powerful. Rather, the cocoa bean was also used as a currency. Aztec ruler Moctezuma II, for example, collected taxes in the form of cocoa beans and possessed a billion of them in the end. The positive features of this primitive money were that it was light, easy to handle and kept well. An unusual feature, however, is that they were just as easily forged as coins. To do this, counterfeiters soaked ordinary beans in water and then dyed them artificially to an ash grey or pale red colour so that they looked like cocoa beans. However, they were not to blame for the inflation that occurred at the end of the 15th century. That was because more and more people cultivated cocoa plants and, so to speak, grew their own money. 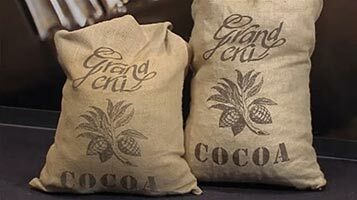 Nevertheless, cocoa beans kept their value as a currency for many years and were very important as loose change. 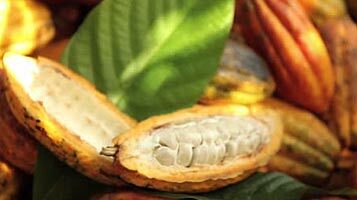 Cocoa beans were still in use as a means of payment in the early 19th century.